Bigpoint is sailing into international waters this month with the action-packed fantasy MMO “KULTAN: The World Beyond”. English, French, Spanish, Italian and Spanish versions of the game will allow intrepid explorers to set sail on an epic voyage of discovery to the mystical, once-forgotten continent of Kultan. As fearless captains in “KULTAN: The World Beyond”, players develop seafaring skills to master the challenges and perils of the New World. The character development of the three available classes is just as important as recruiting the right officers to hone the player’s skills and strategy, and keep their crew’s morale high. Players can select their captain from one of three detailed factions: The proud and unrelenting kingdom of Tian, who obsessively pursue their goals and don’t hold back from using dark powers of mysticism to achieve them; the Almeerah Caliphate, who draw on the great wealth of their long history. Their wisdom and inexhaustible experience leaves them only to fear a prophecy that an ancient, unspeakable evil may rise out of the depths of the ocean once more. And the Republic of Gudtholm, which was recently united following a long war of succession, and now confidently faces a prosperous future. The gripping story of “KULTAN: The World Beyond” can be experienced together with other players, cooperatively or competitively. Rival flotillas must battle it out in epic sea skirmishes for oceanic dominance and make their fortune from the great gold rush for Aicanum treasure. A passion for discovery, a heart full of courage and a dash of daring are all the qualities of a captain destined for greatness. In addition to its story, “KULTAN: The World Beyond” offers a gaming world brought to life with impressive Unity 3D graphics. 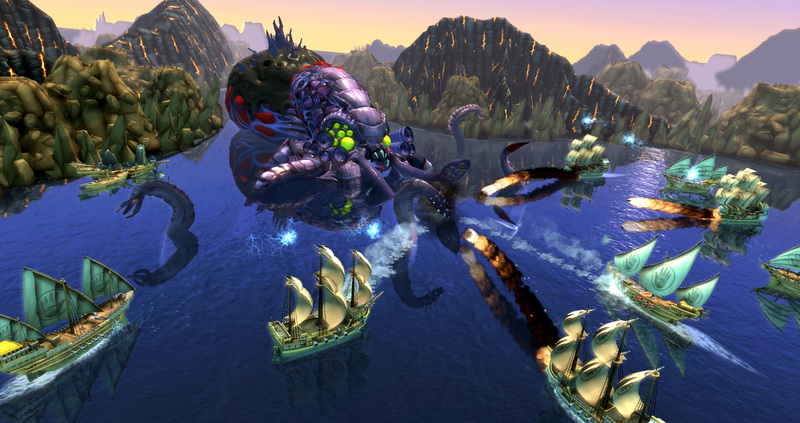 The stories of competing nations, all from very different cultures, are as detailed and lifelike as the myriad of terrifying sea creatures and boss monsters featured in the game. Combined with 36 ship types to allow players to fully customize their crafts, the game offers players the ocean adventure of a lifetime. World of Battleships cartoon version? I thought this would be another MMORPG as ESO or something…. Guess not.